So I got a lot done yesterday. This is the under painting stage so it looks quite rough still. It is the groundwork that supports all of the details and fun bits. It is really nice to work this way as by getting rid of all of the white of the paper you can better judge the values and it is not as intimidating. 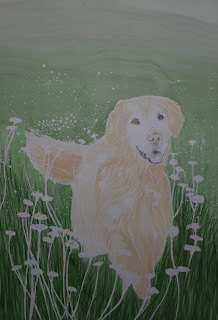 The area above Brandi will have little dandelions speckled throughout, many of them show as white now but I will be adding a yellow glaze to them so they will show up better. The area at the top of the painting will be a darker bush so I did not need to worry about a smooth wash of color. Actually not having it smooth adds texture and interest even though most of it will be covered over with bush and grass. The grass will be much more subtle than the grass in the front though to create the illusion of depth. The foreground has been painted in with many layers of grass and will be glazed in areas to create more variety and depth. The flowers will each be painted yellow and will have petal details, the closer the flowers, the more details. The stems will be painted several shades of green so that they blend in but still read as stems and not grass. Brandi's fur and eyes have been built up with several layers of paint and will continue to be built up slowly adding depth and that soft wispy furry feeling.